Read more about the Gluten-Fee EATUP and all of our NYC picks in New York City: The Gluten-Free Guide, available now on Amazon. In the New York City area or planning to visit soon? 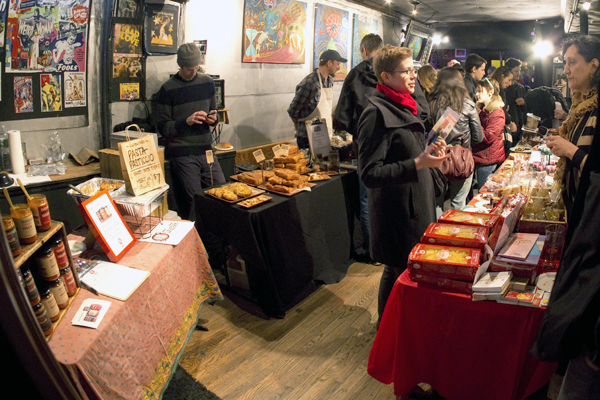 You don’t want to miss the Gluten-Free EatUP, a new monthly pop-up that features 8 to 12 local vendors, all gluten-free. Vendors change from month to month, and their wares range from galettes to pies to sauces to pasta and everything inbetween. If this sounds too good to be true, I can assure you that it is amazing and very real! The market is a collaborative effort produced by Levine’s General Store. 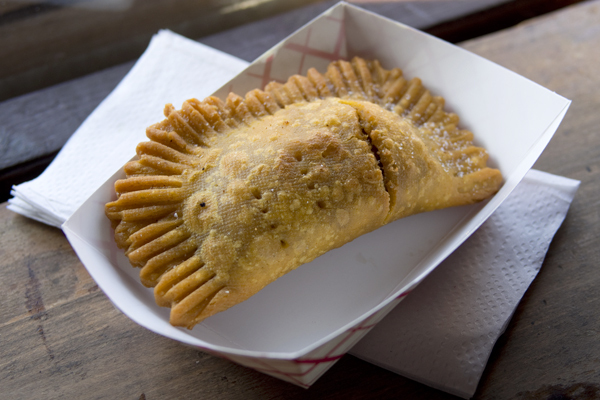 At the March 9th event, Levine’s served up hot Yum Pies, hand pies that looked like little works of art. Look at that crimping! 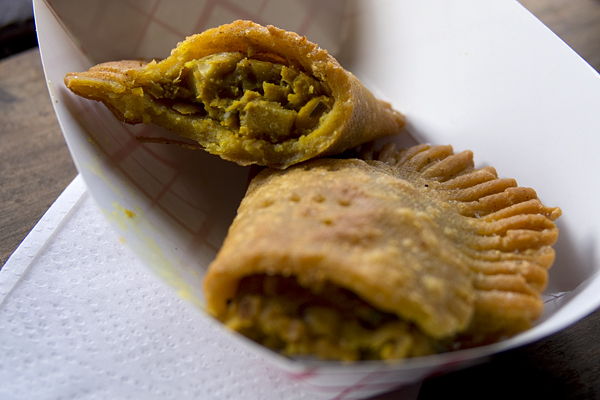 The Chana, pictured below, hit the spot with its dense, buttery crust, Indian-spiced chickpea filling, and raita dipping sauce. Levine’s also had a potato and kale pie on hand, featuring a dairy-free dipping sauce. 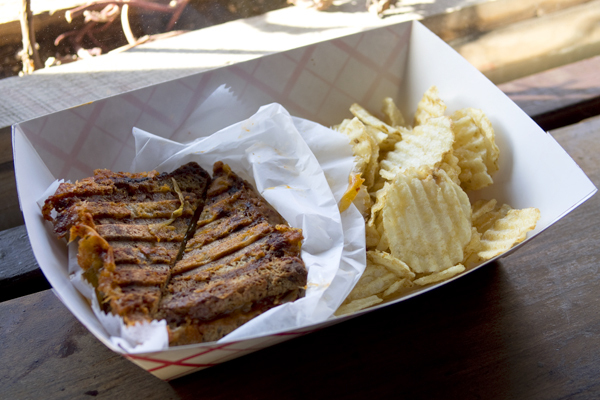 A cofounder of the EatUP, Kimcheelicious dazzled with its genius kimchee grilled cheese. As if kimchee and grilled cheese weren’t good enough on their own, Kimcheelicious grilled its mildly spicy Napa cabbage kimchee with a nice sharp cheddar between two slices of bread from the Gluten-Free Bakery of Chatham NY. Word of warning: it’s almost impossible not to return for a second one of these gooey, spicy, absolutely delicious sandwiches. If you love sweets—and really, who doesn’t?—you’ll want to be sure to visit Sans Bakery’s table. This gluten-free bakery will completely change your mind about what gluten-free sweets can be. 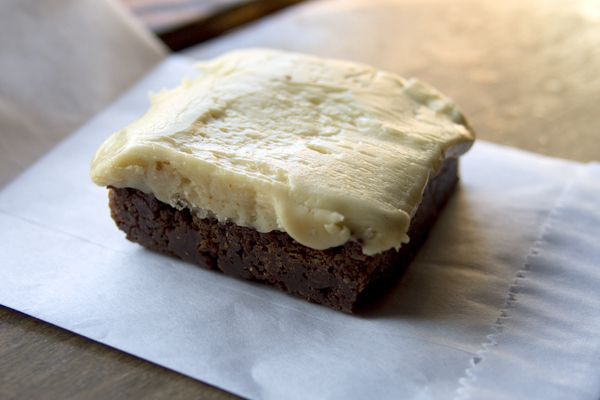 Sans Bakery offers a full selection of cookies, brownies, muffins, and even bagels, but the ginger bars are where it’s at. A perfectly textured bar with an incredible amount of chew, these are topped with a generous layer of spicy ginger buttercream. Ginger lovers, you’ve never had anything that truly captures the essence of ginger this well. And don’t forget the refreshments! Freddy’s Bar, the host venue for the EatUP, has Blackthorn cider on draft and Bard’s gluten-free beer in bottles. Meet, eat, drink, and be [gluten] free! Where? The Gluten-Free EatUP pops up at Freddy’s Bar: 627 Fifth Avenue, Brooklyn, NY (718-768-0131). Anna Sonnenberg is a food and travel writer who has traveled gluten-free since receiving a celiac diagnosis in 2012. Altogether, she has visited over 40 states, 40 countries, and 5 continents; and she has planned and researched gluten-free travel in hundreds of cities. Anna launched Gluten-Free Jet Set in 2013 to share travel advice, gluten-free product reviews, and tips for navigating a healthy, full gluten-free life. Hi Adina! I hope to see more pop-up events like this, too. There’s a new GF event with local makers here in Washington DC as well—The Hour. Seattle can’t be too far behind! I won’t be making it this time, because it’s a bit of a hike for me from Washington Heights and I have another engagement anyway. But I had a blast last time and will definitely be making another trip in the future. The “rye” bread that kimchee grilled cheese was on was so good I had to double check it was gluten-free, seriously! They said it was the caraway seeds that do the trick. That was one of the best sandwiches I’ve ever had. Rye(ish) bread, kimchee, cheese—so great. Hope to catch up with you at one of the next EatUPs! Let me know if you bring Kimcheelicious to DC. I’ll be first in line!